ONLINE REGISTRATION IS NOW CLOSED. YOU CAN STILL SIGN UP IN PERSON ON RACE MORNING. A 5K road race with quotes and fun facts along the course, followed by a BBQ and prizes! The “Run Back to God 5K” is a Bible themed road race for elite runners and casual walkers alike. Participants of all walks of life are encouraged to join us in this family oriented community event which couples a flat and quick 5K course with encouraging reminders of running’s analogous nature to life itself. Long distance events are a constant struggle between the mind, which insists on enduring discomfort to reach a goal, and the body, which insists on stopping the fatigue it must endure in the process. Success on the course is dependent on the runners sacrifice of physical comfort in favor of voluntarily enduring self-induced fatigue to reach a distant prize. The conflict is an inner struggle between the desire for physical comfort and the desire for victory. However, prior to embarking on the endurance race of life, we are called to cast off anything (with God's aid) which may hinder our progress along the course. 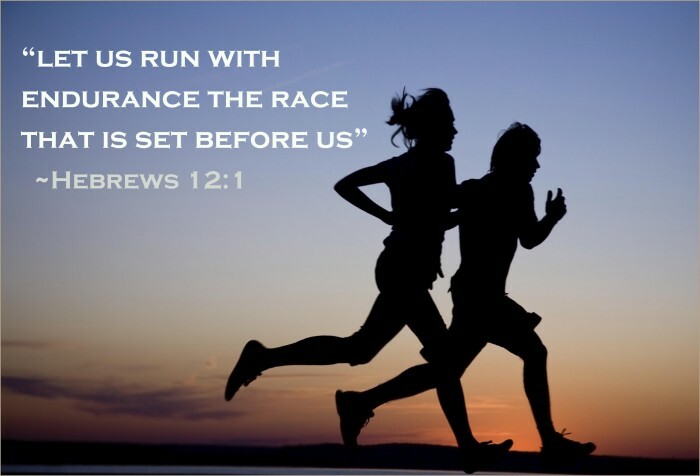 The Bible constantly alludes to our spiritual life as an endurance run or course that we advance through, indicating the expectation of struggles along the journey. Therefore, life requires overcoming hardships and enduring to the end to obtain a distant prize/goal. Unforeseen events constantly hinder life’s plans and goals. The Bible also indicates a source of aid when all seems lost and hopeless on the course of life. Just as a prize is awarded to those who endure the struggles of a race, so too, is a prize awarded to those who faithfully persist along the narrow path of life. We are called to struggle in our spiritual lives just like runners who forget their exhaustion in a mad dash to the finish because their only objective is to attain victory. Succuss on the course is not dependent on our own strength, but reliance on God Himself. Join us in this journey of faith as we run back to God together! Register and pay online (this includes food/drinks afterwards). Register before August 28th and get a free shirt. Participants receive bib numbers upon signing in at church on race day. Afterwards, shuttle buses will drop participants off at the starting line located by Crystal Springs. Participants will run/walk back to the finish line at church (See the Course Map below). Award presentation and all you can eat BBQ at church afterwards.